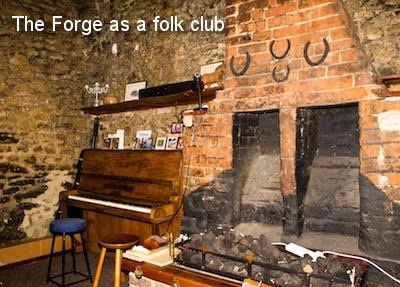 The White Horse Folk Club, Highworth, started in 1974 when Mervyn Penny and friends from the Swindon Folksingers Club decided that they would like a practice night or workshop. 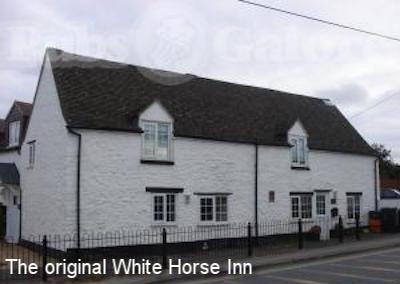 So Mervyn along with Luke Mitchell, Angela Gradwell, Dave Mahoney, Jim Coughlan, Joe Packer and others met at a Highworth pub, The White Horse Inn, though in fact the club took its name from the Vale of the White Horse. 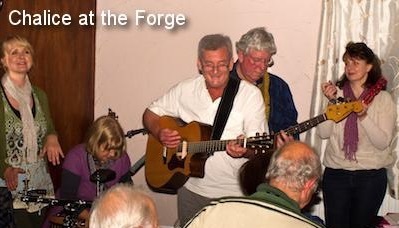 It quickly became a folk club instead of a practice night, with Mervyn running the club, which Bill Bailey (a future club organizer) then joined in 1975. More people came along and Clive the landlord made everyone welcome. The format at that time was purely singaround. In addition the club had two concerts a year, in St Michael’s Hall or the Memorial Hall in Shrivenham when a professional singer was booked, and Mervyn and others did floor spots. A group from the club played at retirement homes and also performed mumming plays. 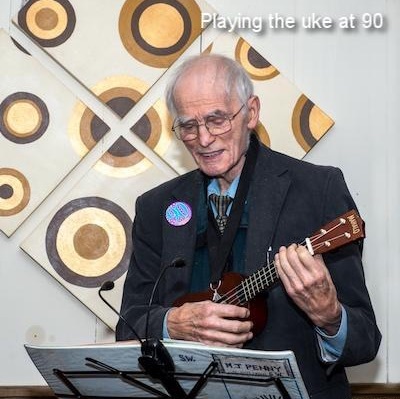 As well as being a regular club member, Mervyn continued to give public performances and to busk into his ninetieth year, supporting his favourite charity, the Prospect Hospice. Mervyn Penny was a great asset to the club. Not only did he have wonderful ability as a multi-instrumentalist, singer and entertainer but he also had remarkable knowledge of folklore and local history. In addition he was an inventive and practical man who enjoyed making many things in his workshop including his own instruments. 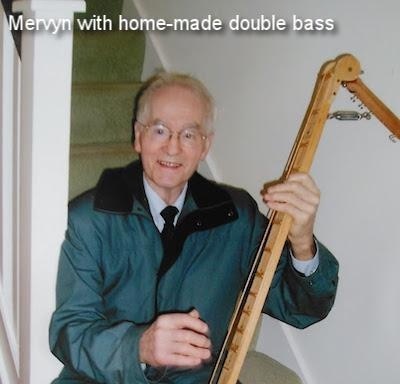 Starting work before the Second World War, Mervyn learned many skills through his engineering apprenticeship. The Great Western Railway workshops in Swindon were renowned throughout the world as a centre of excellence and virtually every craft skill ever developed was to be found here. Mervyn’s motto over the years has been: ‘If you cannot find what you want, then make it!’ Much of Mervyn’s working life was spent at the Royal Military College of Science at Shrivenham, but it was through his wide range of interests that he became known to so many people. 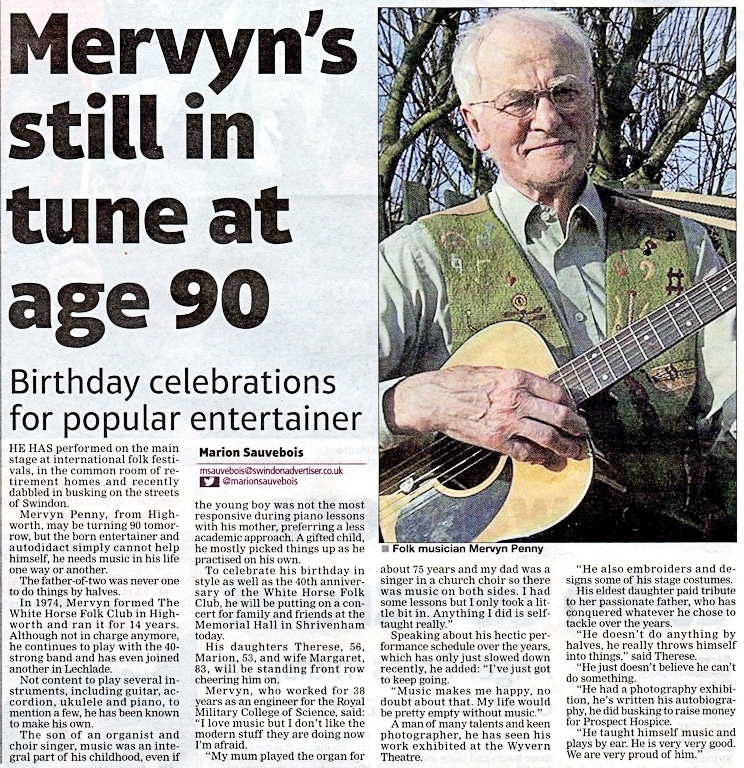 A performer all his life, Mervyn had a huge repertoire, to which he was constantly adding. He gave everyone gentle encouragement and appreciated each performance. We were very proud of him when he starred at the International Eisteddfod with Angela Gradwell, and then when he went on in later years to win twice more. A copy of Mervyn’s CD, ‘The Village Man’ is now held at the Vaughan Williams Memorial Library at Cecil Sharp House. By 1986 Mervyn wanted to take a back seat and, although he continued to perform regularly, Bill Bailey took over the running of the club with some help initially from others including Alan Rothwell. When the pub was modernised in 1990 and the club lost its cosy corner, it moved to The Fox Inn and flourished under the benign hosting of Mary and Brian Wilshire. 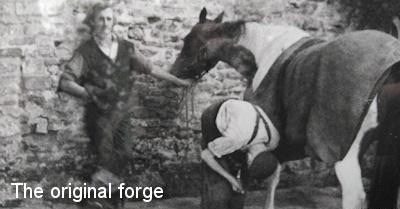 The club met beyond the bar in the Forge, the former blacksmith’s smithy, which, as well as excellent acoustics, provided an atmosphere of rustic nostalgia. 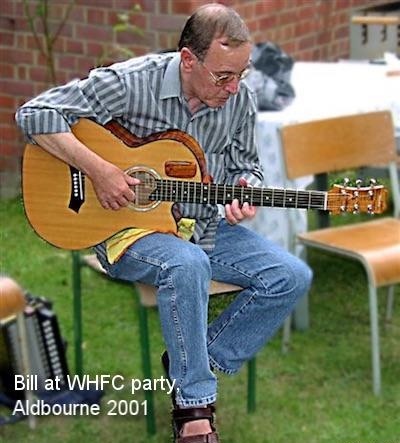 In addition to running the club in a highly committed and thoughtful way, Bill was a brilliant performer, singing and playing complex country-blues on his guitar. 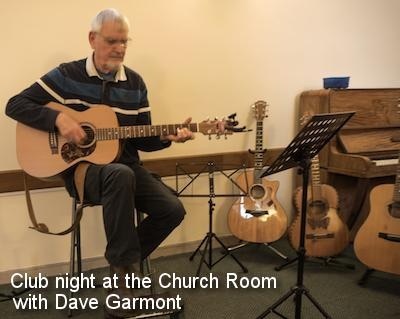 He said that before coming to Highworth he had ‘dabbled’ with the guitar and owned ‘a small collection’ of them, but that it had been the folk club that had given him the incentive to learn. In his turn, Bill was enthusiastic about encouraging others and he also took the time to teach various people to play. During the 1990s and beyond we had close links with other folk clubs, particularly the Oxford Folk Club, the Dragon Folk Club in Shortwood, near Bristol, and the Chipping Norton Folk Club, as well as the Swindon Folksingers Club, with all of which we exchanged visits. 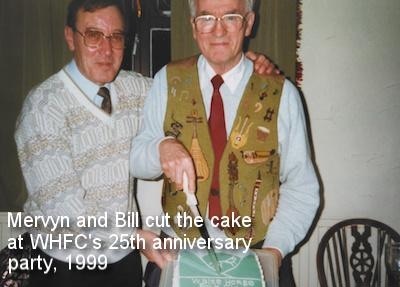 In 1999 the club celebrated its 25th year and Helen Barr made a fabulous cake, as shown in the photo below. 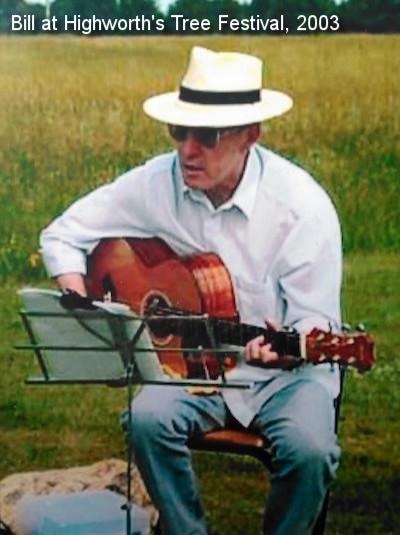 Building on friendships with neighbouring clubs, in the last year of his life (2002-3) Bill had helped Bill Long of the Chipping Norton club to set up a Folk Class at the annual Chipping Norton Music Festival. Here folksingers could feel at ease in a cabaret-style layout rather than facing rows of chairs as in the classical classes. After Bill Bailey passed away on 30 October 2003, members of the WHFC donated a silver rose bowl to the Chipping Norton Music Festival inscribed ‘The William Bailey Award’, presented to the performer who best communicates a song. Mervyn, and also Helen (a superb folk-singer as well as our treasurer) were the first to win this trophy for our club, and several members still take part in the Chipping Norton Festival every year. Mervyn felt that WHFC should have its own annual award, so in 2004 he commissioned a statuette of a traditional singer. He asked members to vote for the ‘best’ folk club member of the year in light-hearted recognition of their contribution to the success of the club. We instigated a Founder’s Night for our first meeting in each New Year, when Mervyn would perform an extended Spot and then award the trophy. In 2003 Dave Garmont became organizer of the club, with Lefty Wright as MC and Helen remaining treasurer, while Mervyn continued as a regular member. From 2004 Chris and Derrick Beer took over as organizers with Geoff Davies and Maria Cormack as treasurers. We set up a committee which still meets regularly and whose members take it in turns to be MC. Dave Garmont brought the club into the 21st century by constructing the website and he regularly updates the photos of guests and members. We had to leave The Fox after Mary retired and the pub, after a few changes of hands, eventually closed in October 2013. Following a brief sojourn at the King and Queen Inn the club took up residence at the Church Room, St Michael’s Church, Highworth where we still meet. 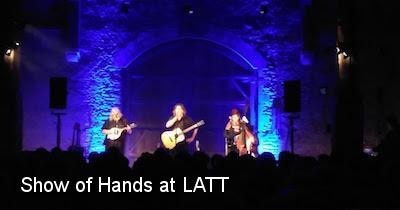 In recent years we formed links with the Riverfolk Acoustic Club run by Jay Mathews and the late much-lamented Ray Mathews at Lechlade. With these inspirational people, Derrick and Chris set up a festival at the monastic barn in Great Coxwell, called Live at the Tithe. After a day out at all the little stalls and many activities including at the busking tent and folk stage, everyone enjoyed evening performances in the barn’s magnificent historic setting. Against magical background illumination we watched star singers such as Show of Hands, Jez Lowe and Martyn Joseph. 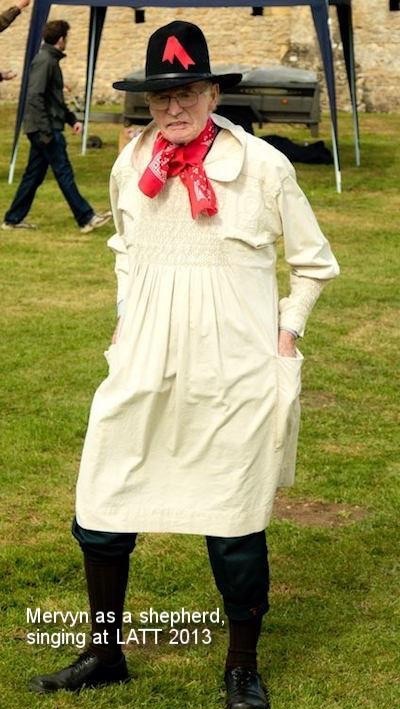 Mervyn enjoyed the Live at the Tithe festivals enormously and performed wearing his traditional shepherd’s smock, as shown below. 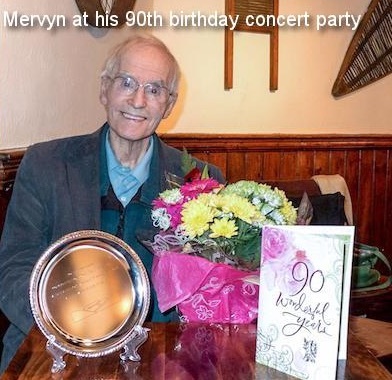 Mervyn was fortunate in having the wholehearted support of his wife, Margaret, and all his family, many of whom are musical; Mervyn and Margaret celebrated their diamond wedding some years ago. 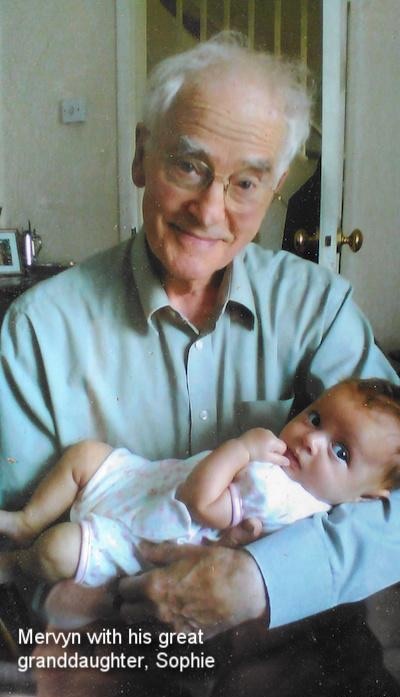 Mervyn, who is very much missed, passed away on 14 January 2014, aged 90, and we still carry on the tradition of the Founder’s Award. 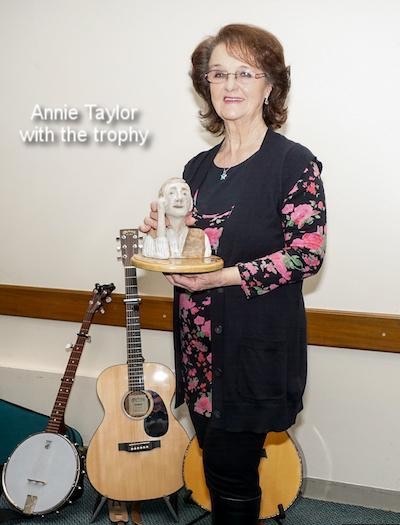 Other links more recently formed with nearby clubs are with Acoustic in the Alley at the Brown Jack in Wroughton, started by Rod and Judy Clifton of the WHFC, and members are also venturing further afield, exchanging visits with the clubs in Witney and Stroud. Meanwhile, the White Horse Folk Club, now in its 44th year, goes from strength to strength with many loyal core members as well as occasional visitors. Chris and Derrick arrange concerts at Warneford School and The United Reformed Church in Highworth every few months in addition to booking professional singers for club nights. There is always a good crowd and we appreciate all types of acoustic music, welcoming all ages, newcomers and regulars alike. The club starts at 8pm every first and third Wednesday of the month at the Church Room, and the format allows for plenty of floor singers even on nights with a guest performer. We think both Mervyn and Bill would be happy at the success of the club – come early to be assured of a seat!